So you’ve finally realised your tatty, ill-fitting garage door needs replacing. You know what style, colour and finish you want and you’ve found some great offers. All you need now is to sit down with a cup of tea, have a quick browse through some You Tube videos about fitting it and you’ll be sorted. STOP! Unless you are a very, very experienced DIY-er we would not recommend attempting to fit your own garage door. The most obvious reason is safety. Garage doors are large and heavy and can cause serious damage or injury if they fall. The springs in a door are under enormous pressure and if they are not fitted correctly they too can cause serious damage. Every year in the UK more than 5,000 people die in accidents in the home and 2.7 million turn up at accident and emergency departments seeking treatment. By using a reputable, experienced professional garage door fitter for repairs and installations you can make sure you are not one of these statistics. Do some research as to how long the fitter has been established and ask to see examples of his/her work or testimonials. Look for a professional accreditation such as membership of the Door and Hardware Federation (DHF). If you use a DHF member you will benefit from a two-year warranty on all products, accessories and installations as well as a DHF-backed aftercare service. A professional installer can also offer advice and expertise about which type and style of door would work best for your purposes. They will also have relationships with leading door manufacturers giving them access to the best deals. 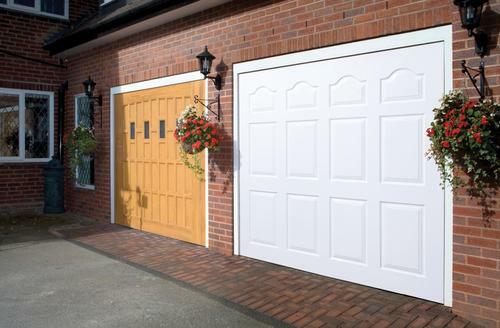 To find out more how AJS Garage Doors can help you please call us on 01992 630 404 or pop into our Cheshunt showroom. Next: Next post: Why does accreditation matter?